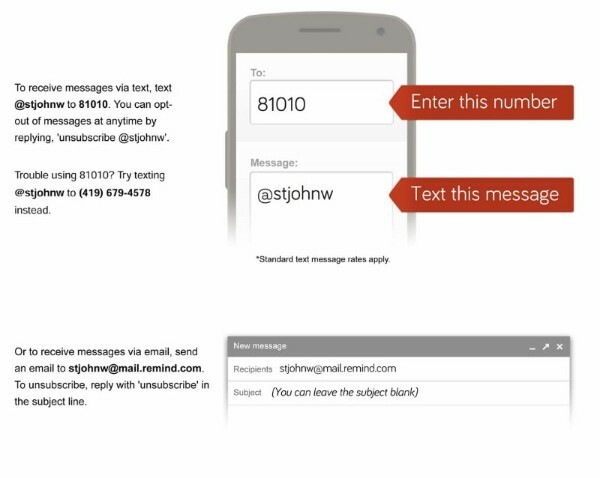 If you would like to be reminded of upcoming events through email or text, join St. John on Remind… Text @stjohnw to the number 81010. (You'll receive a welcome text from Remind.) (If you have trouble with 81010, try texting @stjohnw to (419) 679-4578.) For reminders by email, send a message to stjohnw@mail.remind.com. If none of those work, send an email to pastorobrien@stjohnwilliston.org and he can sign you up.